Iran's weekend test firing of yet another long-range ballistic missile is amplifying congressional calls for the Trump administration to formally declare Iran in violation of the landmark nuclear agreement, a move that would lay the groundwork for the United States to abandon the agreement. Iran claims to have successfully test fired a new long-range ballistic missile in response to threats by the Trump administration to leave the nuclear accord. President Donald Trump criticized Iran during his first speech before the United Nations last week, singling out the Islamic Republic as one of the leading global threats. 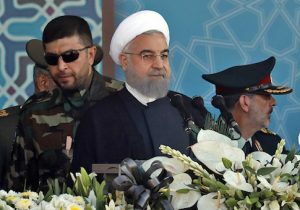 The speech prompted tough talk by senior Iranian leaders and military officials, who vowed to boost the country's capabilities. The latest ballistic missile test has amplified congressional calls for Trump to leave the deal and has provided grist to those inside the administration pushing for the president to formally declare Iran in violation of the nuclear deal due to these tests and other actions that violate the accord. "Iran's missile test is further proof that the Obama-Khamenei nuclear deal has only served to empower and embolden the Islamist regime," Rep. Ron DeSantis (R., Fla.), a member of the House Foreign Affairs Committee, told the Washington Free Beacon. "Given Iran's belligerent conduct and its violations of the terms of the deal, President Trump should follow his instincts and decertify the JCPOA in October," DeSantis said, using the acronym for the nuclear agreement, also known as the Joint Comprehensive Plan of Action. "We can't allow Iran to follow in the footsteps of North Korea when it comes to acquiring a nuclear capability." DeSantis's comments jibe with public remarks from Trump and some of his most senior officials, including United Nations Ambassador Nikki Haley, who has been a vocal critic of the nuclear accord and Iran's threatening behavior. Haley, commenting on Iranian violations of U.N. accords last week, said that U.S. is focused on holding the Islamic Republic responsible for defying these resolutions. "What we're looking at and what you're going to hear us very vocal on is the fact that 2331, the resolution that was in place, what we saw was it basically wrapped in with the nuclear deal; it said if Iran did any of these things, it would be in violation," Haley said, adding that evidence indicates Iran has violated international resolutions multiple times. The ballistic missile test shows that Iran had made further strides in its long-range ballistic technology and that international calls for it to refrain from such behavior have no impact on the country's actions. Under U.N. Security Resolution 2231, which codifies the nuclear agreement, Iran is prohibited from test firing ballistic missiles, though the restriction has not altered Tehran's behavior. The newest missile, unveiled during a Friday military parade in Tehran, is reported to be Iran's third such rocket capable of traveling nearly 1,250 miles. It weighs more than a ton and can carry "several warheads," according to reports in Iran's state-controlled media. Trump offered a strong response to the missile test, tweeting that the missile is "capable of reaching Israel." Iran is also "working with North Korea. Not much of an agreement we have," Trump wrote. The tweet is being viewed as a window into Trump's thinking on the deal and whether he will formally designate Iran as in violation. A State Department official told the Free Beacon that officials are looking into the missile launch and will seek to counter the threats posed by Iran's continued rocket tests. "We have seen the media reports that Iran launched a ballistic missile," the official said. "We are looking into these reports." "As we’ve said before, Iran's continued ballistic missile development and support for terrorism are provocative and undermine security, prosperity, and stability throughout the region," the official added, noting that "UN Security Council Resolution (UNSCR) 2231 (2015) calls upon Iran to not undertake any activity related to ballistic missiles designed to be capable of delivering nuclear weapons." The administration "will continue monitor these issues closely and to use all of the tools at our disposal to counter threats from Iran’s missile program," the official said. While the Trump administration has recertified the deal in the past months, some believe that Trump has decided not to do so again. One veteran Middle East analyst who works closely with White House official on the Iran portfolio told the Free Beacon that Trump's tweet is a good indication of where he currently stands on the matter. "The president's tweet reflected exactly how he feels, and everyone at every level knows it," the source said. "He thinks the deal is garbage because it's riddled with so many flaws, in this case dismantling sanctions while Iran builds ballistic missiles capable of striking Israel and Europe." However, there have been internal tensions of the matter, with Secretary of State Rex Tillerson pushing for Trump to keep the agreement. The Free Beacon first reported last week that disagreements between Tillerson and Haley on the matter have been a source of tension in the State Department. "The State Department has been fighting [Trump] at every turn because Tillerson and his Obama holdovers want to preserve the deal," the source explained. "So suddenly they've begun downplaying Iranian missile launches, because that would make it obvious how the deal isn't in America's national interest." Iranian President Hassan Rouhani has vowed a fierce response if the United States decides to leave the deal, saying in a recent interview such a move would "yield no results for the United States, but at the same time, it will generally decrease international trust placed in Washington." Iran is prepared to respond if the United States abandons the agreement. "We have thought long and hard about our reactions," Rouhani said, noting that these reactions would come "quite swiftly" and "probably within a week." Meanwhile, Iranian military leaders have disclosed the Islamic Republic continues to build advanced weaponry, despite international bans on some of these arms. "Different missiles and ground combat weaponries, along with our air defense and marine combat systems, are all made in Iran and our ready-to-service experts will continue this path robustly," Brigadier General Amir Hatami, Iran's defense minister, said during the weekend.